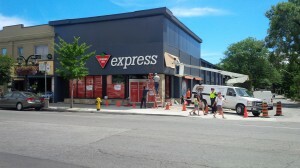 New Canadian Tire Express store at Pape and Danforth – Smart strategy by a quintessentially Canadian brand. Retailers need to start thinking out of the box and thinking about how they can serve their customers better. 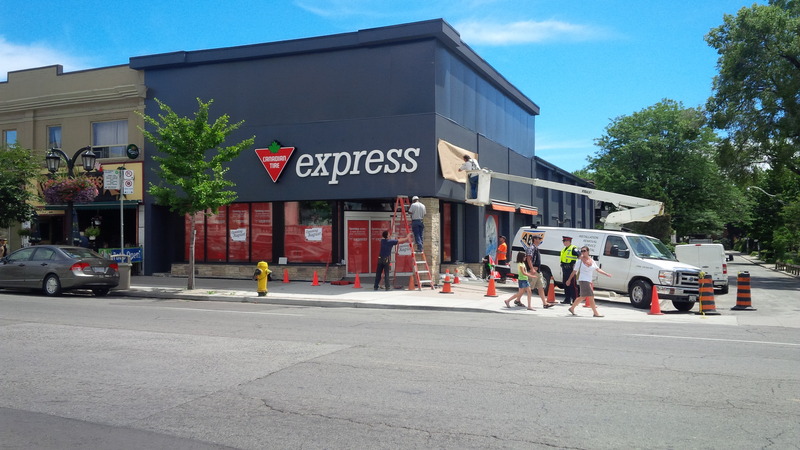 That’s just what Canadian Tire is doing with the opening of their new Express store today, right at the corner of Gough Avenue, in the heart of Toronto’s Pape and Danforth neighbourhood. With a mere 6,100 sq. ft. location (a far cry from some of its suburban locations that average close to 35,000 sq. ft.) Canadian Tire is continuing to expand its reach by not only thinking small, but smart. So what’s the idea behind the retailer’s marketing strategy? Well, the retailer may have just tapped into something big, which really comes down to the heart of how Torontonians feel about their neighbourhoods. Remember the outcry from residents in Kensington Market when they heard that Walmart wanted to open up a store in their neighbourhood? Like a lioness protecting her cubs, Torontonians have a fierce loyalty towards the local businesses that make their neighbourhood thrive echoing in practice what Jane Jacobs believed: that “the point of cities is multiplicity of choice”. And when we think of Canadian Tire, we identify with it, quintessentially Canadian—a trusted and recognizable brand. If you frequent downtown Toronto often, no doubt you will have realized that the future is within the city’s inner core. You can barely face any direction without a gigantic crane creating a huge eyesore. Condo construction is at an all time high and the need for urban stores that can be a one-stop-shop for busy downtown consumers will surely be in high demand. This is consistent with Jeff Rubin’s argument that “we must re-engineer our lives to adapt to the contours of a much smaller world”. The smaller scale (but well-stocked) Home Sense stores located on Spadina Avenue and Yonge Street are booming and symbolic of this trend. Canadian Tire’s marketing strategy to sell you everything, is definitely paying off: in the Canadian Tire Express store, they have just tweaked that strategy and become more focused. The Pape and Danforth location is unique in that it’s a melding point of communities – from Riverdale, to Greenwood Coxwell and Danforth Village. Plus for urbanites who don’t own a car, the subway line is located so conveniently: a brilliant choice in real estate whereby the key of “location, location, location” is paid lip service to but overlooked in terms of execution. Torontonians are also undergoing a big dig of sorts in the update to the city’s transportation infrastructure. With all the construction going on at Lakeshore, Leslieville and the Beaches, this store will no doubt also be a go to hub in the interim. In the 1980s, the company’s memorable tagline was “there is a lot more to Canadian Tire than tires” however keep mind that if you do need tires or your car needs a check-up you will have to head over to the mothership location at Leslie and Lakeshore. How does a company that’s primarily known for selling you everything, going to switch gears and think small? 1. It plans to stock most categories that the chain is known for, but fewer items. 2. If you need anything that’s not available you can order it to be delivered to the store or to your home (for a very reasonable delivery fee). 3. Inside, the design resembles a neighbourhood hardware store (except perhaps for the four giant TV panels). Outside, it looks upscale and blends into surroundings. 4. An ingenious idea to maximize space has been deployed using smart hidden panels in the hardware area, which pack in an extensive range of nuts, bolts, fasteners, etc. 5. The company has tapped into a lifestyle. Residents can easily grab a cooler and blanket from Canadian Tire, pick up some ready to go food from the nearby shops, and head over to Withrow Park for an impromptu picnic. Kudos to a store that’s thinking out of the box and making a blink in an urban neighbourhood. We give it a #ThinkBlink star. Good article and a good idea by the company. Many “boomers” who grew up in smaller communities remember a small, neighbourhood Canadian Tire store in the downtown area, and this is a return to that concept. The strategy by Canadian Tire is a good one but the devil is in the details of the execution. Traditionally, Canadian Retailers have lagged in terms of the touch points necessary for a memorable reatil experience but this concept of a downsized neighbourhood store may be a step in the right direction. Time will tell!